The evidence of improved performance of agriculture in Africa south of the Sahara (SSA) in recent years has indeed been quite striking when compared with the past. For the first time, the sector has maintained a real growth rate of 3.4 percent per year, well above the population growth rate of 2.5 percent. Despite this improved performance, agricultural productivity growth in SSA continues to lag behind every other region of the world, growing at rates that are roughly half of the average rate of developing countries. Previous studies concluded that SSA should increase investment in agricultural research and development (R&D), highlighting the need to facilitate farmers access to technology, markets, and the necessary support services for raising agricultural productivity. 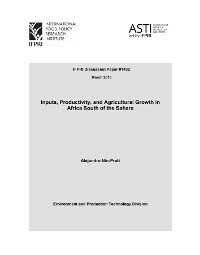 This study introduces a new dimension to the puzzle of agricultural productivity growth in SSA: the role of the input mix and the need to increase capital and inputs per worker not only to boost output per worker but also to accelerate technology adoption and total factor productivity (TFP) growth. According to the appropriate technology hypothesis, advanced countries invent technologies that are compatible with their own factor mix, but these technologies are less productive with the very different factor mix of poor countries.